TENMAT Firefly 130 Fire Rated Socket/Switch Box Inserts are a cost effective and simple fire and acoustic solution for protecting electrical switch and socket boxes when fitted in fire and acoustically rated walls. The fire resistant material fully lines the socket to provide a fire seal that limits the spread of fire within and through the partition. The Switch Box Inserts are pre-formed and can be installed in seconds without assembly or adhesives. The profiled design ensures that the insert can be simply push fitted into the electrical metal or plastic back boxes. The flanged design also ensures that the Socket Box Insert remains in position during a fire even when fitted within plastic drylining boxes. In addition, the insulative nature of the product and gasket sealing design also ensures acoustic performance of the wall can be maintained and air leakage through the socket can be minimised. 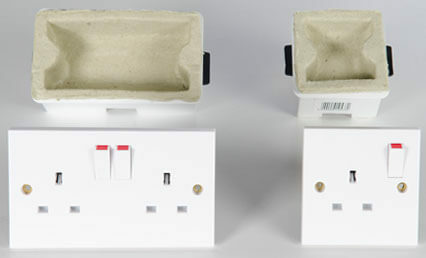 Offering significant labour and cost savings over plasterboard lining or putty pad solutions, the Socket Box Inserts are available to suit both single and double sockets. 2 hour fire tested to BS476:part 20/22:1987 for both integrity and insulation. Suitable for insulated and uninsulated plasterboard partitions. 2 hour fire tested to the principles of BSEN 1363-1:1999 for both integrity and insulation.